How Good Can Randy Moss Be? soul and tap into his inner Kierkegaard? at me. "O.K.," he says, "shoot." impression of you, and if they aren't, does that bother you? speak my mind." The interview lasts a half hour. 3 New York Giants Can a little Shockey treatment from a rookie tight end toughen up a soft offense? 1 Green Bay Packers Newly arrived bad boy Terry Glenn is healthy and wealthy, but is he finally wise? Q+A Lleyton Hewitt As he got ready for this week's tournament, the U.S. Open's top seed--and only seeded Australian--took time to volley with SI. early 1970s have seven words caused such a stir. it the rest of his life." thought of as a fool than to speak and remove all doubt." right in the f------ face." 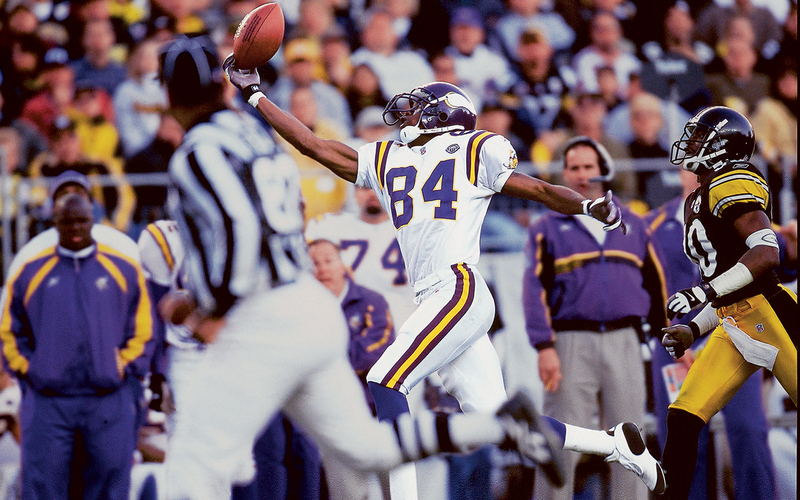 Moss from the receiver's rookie season. me but my mama and God." demonstrate how they would design a game plan to utilize Moss. (flanker, split end and slot) and be put in motion frequently. 1,848 yards and 22 touchdowns. getting the ball as the rest of us think. "I just want to win,"
think I can spark the team and get the crowd into it." people get the meaning of 'I play when I want to play,'" he says. trying to set DBs up and to save myself for the 'six.'" Does this mean he regrets having made the statement? "Hell, no,"
Woods is about to make the turn in the second round of the U.S.
familiar twang. "You know that interview we did?" "I want to do it over." encountered upon joining Minnesota, Moss replies, "Hell, no. It's frustrating how political this damn game is." image as Moss's mentor and served as his de facto press liaison. tried to instill the discipline he felt had lapsed under Green. Minnesota had driven for a touchdown. this locker room to take up for Cris." sensationalize everything, and everyone who's gone is bad." couldn't bring himself to do it." an i-n-g. I mean, are we talking Las Vegas?" since he entered the league, he has never missed a game. bounce back from that in days. It takes years." call that kept me from getting to the Super Bowl." "No," Moss says. "Not kill him literally." say things I regret, I've got to pay for it." The only question now is, Will the rest of the league pay?